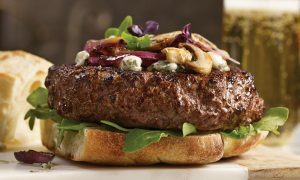 **12 Filet Mignon Burgers from omahasteaks. Price: $44.99. Discount: $74.98. Categories: Food, Cooking, Meal, Mignon Burgers. Deal Rating: 5 Stars out of 5. Store Rating: 5 Stars out of 5. Deal Recommendation: Recommended. Available Until: Limited Quantity. Thoughts: Combo Price – 12 Filet Mignon Burgers. Deal Score: 90 out of 100.